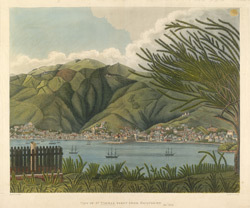 An aquatint by the French ornithologist Louis Jean Pierre Viellot of the town and deep natural harbour at Charlotte Amelia on St Thomas, the Virgin Islands. Columbus came upon the Virgin Islands in 1493 but it was not until two centuries later that the first European settlement was established there by the Danish. The town of Charlotte Amelia was named in honour of King Christian V's wife.